The Walking Dead creator Robert Kirkman reveals that Carl Grimes might not die. The show is currently on hiatus and fans are eagerly awaiting the midseason premiere date and now they might have a whole other reason to tune in. 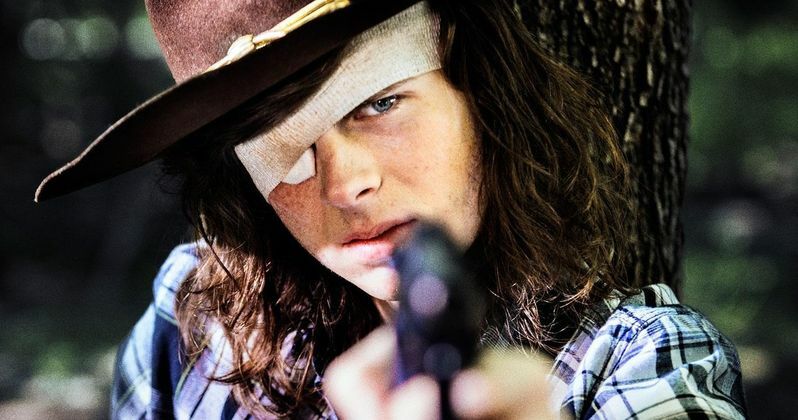 The fall finale revealed that Carl had been bitten by a walker, much to the shock of The Walking Dead fans and even the cast. What exactly is Robert Kirkman teasing here? Is this just a clever ploy to get some ratings up? Robert Kirkman recently spoke at a Q&A where he teased that Carl Grimes might not die. Kirkman went on to talk about the ramifications Carl's death could have on Rick, as well as the show as a whole, and the comics. He had this to say. "He's not dead yet. He might not die. You never know. But I think if, were that to happen, I think that it would have some interesting ramifications on Rick, that I think would energize and really kind of set things in motion in a really interesting way leading to the resolution of All Out War in a way that will make for a very exciting back half to Season 8, so I think it's going to be really cool." It's not clear how the show would pull off the amazing feat of keeping Carl alive. It would kind of defeat the main plot in which the whole series is based, so it seems like there's another reason for Kirkman's comments. When it was revealed that Carl was bitten, The Walking Dead fans were outraged and Robert Kirkman defended the decision at the time. It was a tough decision to make, but Kirkman said that it was their duty to keep fans on their toes, to understand that anybody can die at any time. Fans were not buying it at all and now Kirkman seems to be going back on some of the things that he said when the season ended. Actor Chandler Riggs who plays Carl on the show was promised that production would work around his decision to go to college. But as Riggs' father points out, they fired him after they promised to have him around for the next three years, which caused a separate controversy on its own. It doesn't seem possible to keep Carl alive, so it looks like Robert Kirkman is just drumming up some excitement for The Walking Dead since the show has hit a ratings slump. The death of Carl is a major plot twist that nobody saw coming, which is reminiscent of the Game of Thrones approach and what many consider to be good writing. It looks like there might be one episode left for Carl, so hopefully it's a good one. Or maybe Robert Kirkman is really trying to keep him alive, it's too early to speculate about that now. You can check out the Q&A with The Walking Dead creator Robert Kirkman through ComicBook.com.